I can honestly say that cauliflower is one of my favorite vegetables. It is a powerhouse when it comes to nutrients, specifically phytochemicals. Known as a cruciferous vegetable, cauliflower is in the species Brassica oleracea, along with brussels sprouts, cabbage and broccoli. Cauliflower contains the phytochemicals isothiocyanates, indoles and glucosinolates. These have been found to aid in detoxifying carcinogens. They help limit the production of cancer-related hormones and can even block tumor growth. Did you know there are 4 different colors of cauliflower? Certainly white is the most common but there is also orange cauliflower (which contains 25 times the level of vitamin A as the white variety), green cauliflower (also called broccoflower) and purple cauliflower (purple due to the presence of the antioxidant anthocyanins as are in red berries). I’ve never had any other than the white variety, I just saw orange cauliflower but I really want to try the purple variety, eating purple food just sounds fun! Nutrition facts: Cauliflower is low in fat and carbohydrates but high in fiber and an excellent source of folate and vitamin C. Raw cauliflower contains 25 calories per cup. Hard to believe those 25 calories can be packed with so much good nutrition! This recipe combines roasted cauliflower with arugula, dried fruit and seeds with a simple apple cider vinegar dressing. While you could use a different salad green than arugula, it provides a wonderful peppery flavor that balances the mild cauliflower taste. The pumpkin and pomegranate seeds add crunch while the dried cranberries add just a touch of sweetness (dried cherries would be tasty too!). Perfect for holiday gatherings or alongside a quick meal of roasted chicken or pork chops. Heat oven to 450 degrees Fahrenheit. Cut cauliflower into bite size pieces (florets). Toss cauliflower with 1 Tbsp olive oil, salt and pepper. Place on ungreased baking sheet and roast for 10 minutes. Meanwhile, make the dressing. Combine the remaining ¼ cup olive oil, apple cider vinegar, pinch of salt and pepper in a jar with a lid. Shake to combine. 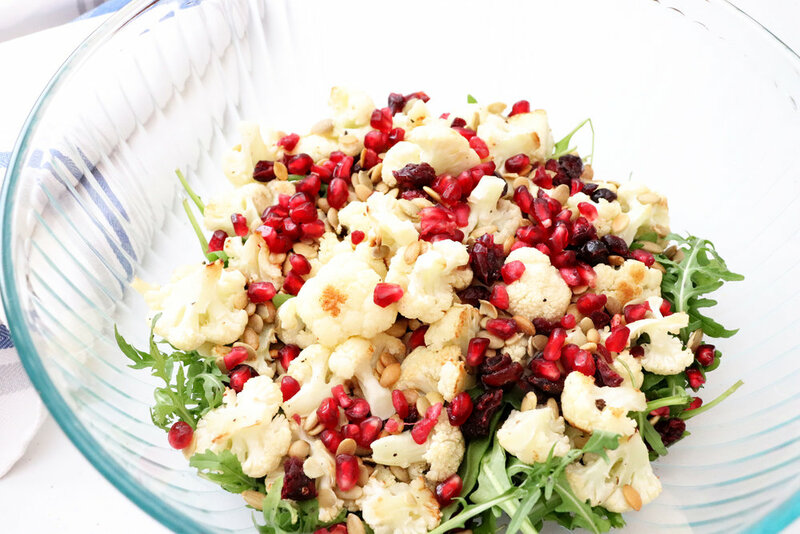 In a large bowl combine the roasted cauliflower, arugula, dried cranberries, pumpkin seeds and pomegranate arils. Pour the dressing over the salad and toss gently to combine.